Nafplio (Nauplia) lies North-West of Ermioni. It is been classed as one of the most beautiful cities in Greece, and was the first capital of Independent Greece, 1829 to 1834. Today it is the capital of Argolida, with a population of approximately sixteen thousand inhabitants. Nafplio is a main tourist destination throughout the year, not just for its history, but also for the surrounding areas. From an architectural point of view, the old town of Nafplio is a collection of Frankish, Venetian and Turkish buildings, both secular and neo-classic. Its broad streets and small alleys, its squares, fountains, monuments, statues and beautiful parks, make this charming city captivating for its visitors. There are numerous waterfront cafes, charming tavernas and traditional cafes in the old town, mostly situated around Syntagma square and the 'avenue of tavernas' above the square. 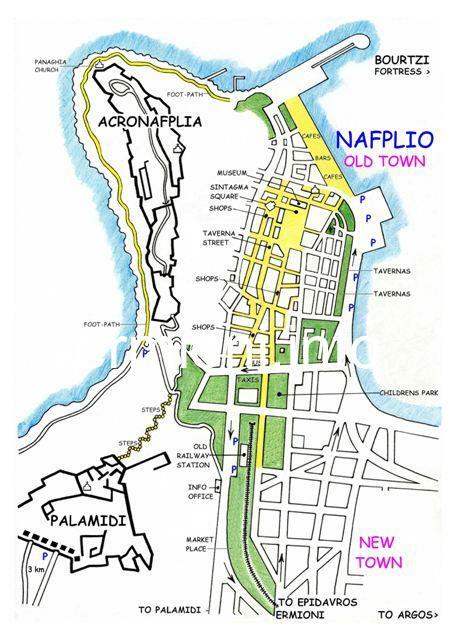 The name of Nafplio was given to the city after the name of the mythical hero Nafplios, son of the god Poseidon. The main symbol of the city is the Bourtzi fortress (above) built by the Venetians in 1471. Situated in the old harbour, opposite the Miaouli promenade with all its cafes and bars. This fortress later became a prison, then a hotel, and now, a tourist spot for visitors. The car-park on Bouboulinas Street, near the Bourtzi fortress, offers free all-day parking and is very close to the centre of the old town. There is a scenic coastal pathway that starts at the far end of the Miaouli promenade, opposite the Bourtzi fortress, that takes you around the peninsula and brings you back to the bus station area of the old town. This walk gives you wonderful views of the surrounding coastline, and you pass the small Panaghia church, the Acronafplia castle and the base of the Palamidi fortress. Near the bus station, next to the reconstructed 'Shore Gate' (right) and childrens park, there is the old city railway station, complete with steam train and carriages, where you can have a coffee or cold drinks inside the railway station itself, following your scenic walk. In addition to the picturesque Bourtzi fortress, Nafplio can also offer visitors the early 14th Century Byzantine castle of Acronafplia and the Venetian Palamidi fortress (left). Taking only 4 years to build, Palamidi was completed in 1714 on the 216 metre high hill, offering visitors fantastic views of the whole city from its battlements. Access to Palamidi can be walked up the 857 steps (to reach the top of the fortress there are over 999 steps) taking approximately 25 minutes, or 4 kms by car or taxi to the fortress rear entrance. Admission to Palamidi: 8 Euros. Admission to Acronafplia: Free. The fortifications overlook the old town which houses the new Archaeological Museum of the Peloponnese in Syntagma Square. On the second floor of this museum, there is an excellent exhibition of all the historical finds of Ermioni, Ancient Hermione, in addition to a section showing the history and finds from the pre-historic Cave of Franchthi, opposite Kilada. A separate room shows a film of the discovery of the unique Mycenaean bronze suit of armour from Dendera, which is on display in the museum. Really worth visiting. The museum is open daily 08:30 - 15:00. Closed on Mondays. Admission: 2 Euros. The Folklore Museum - One of the most important museums in Greece. It consists of national costumes of the region, with over 20,000 items on display, including traditional local art, woven and embroidered articles, various utensils and implements as well as old maps of Nafplio. On the second floor there is a small shop where visitors can purchase CDs with local music, books and calendars. The museum is open daily 09:00 - 14:00. Closed on Tuesdays and the entire month of February. The War Museum - This building was the first Military Academy, and displays assorted weapons and uniforms from the Greek War of Independence to the Second World War. There is also a large collection of other historical items, old paintings from the 19th Century and photographs from the early and mid 20th Century showing the Hellenic nation at war. Descriptions in Greek, French and English. The museum is open daily 09:00 - 14:00. Closed on Mondays. Admission: 3 Euros. The Children's Museum - Situated at the old city railway station. It houses a steam engine and vintage freight and passenger cars, with a playground and sandbox in front. There is a Cafe within the old train station, ideal for a coffee or a long cool refreshing drink. There is a childrens park next to the railway station, where there is a playground area situated under tall trees offering shade. The Komboloi Museum is where you will learn about the history of the famous Greek 'worry-beads', and is the only museum of its kind in Greece. It has over 1000 komboloi on display from the 18th to 20th Century. Souvenir books and quality replicas of these komboloi can be purchased here, hand-made from wood, amber, sea shells, corals, crystal, as well as modern man-made materials. The museum is open daily 09:30 - 20:30 Closed on Tuesdays. Admission: 2 Euros. MEDYS 2019 - Nafplio will host the 6th annual Mediterranean Yacht Show. This is a 4-day event organised by the Greek Yachting Association held during the last week in April. It is an opportunity to see all the latest designs of luxury cruise motor boats and yachts available to charter and showcases the very best in the Marine and Boat industry. This has become a very popular event over the last few years, since the event was relocated from the island of Poros, now attracting many more visitors for this spectacular show in beautiful surroundings. 'Castle Run' 2019 - Takes place each year on the last Sunday of November. The annual 5km race starts with a steep climb up to the historic 18th Century Venetian fortress of Palamidi which overlooks the town, along the 999 step pathway to the top. It's tiring just walking up those steps. The second part of the race, 4kms down hill, includes the route on the asphalt road leading to the finish line. Almost 400 brave runners took part in the 2018 Castle Run, considered to be one of the toughest races held in the whole of Greece. 'Sleeping Lion of Bavaria' war memorial is located on the outskirts of Nafplio, close to the road that leads up to the Palamidi fortress. It was commissioned on the orders of the father of King Othon, the first King of modern Independent Greece, and sculptured by Christian Siegel. It was created in memory of his Bavarian officers and soldiers that were killed or died helping the Hellenes establish their freedom following the Greek War of Independence, 1821-29, and for those who died in the typhoid plague epidemic of 1833-34.